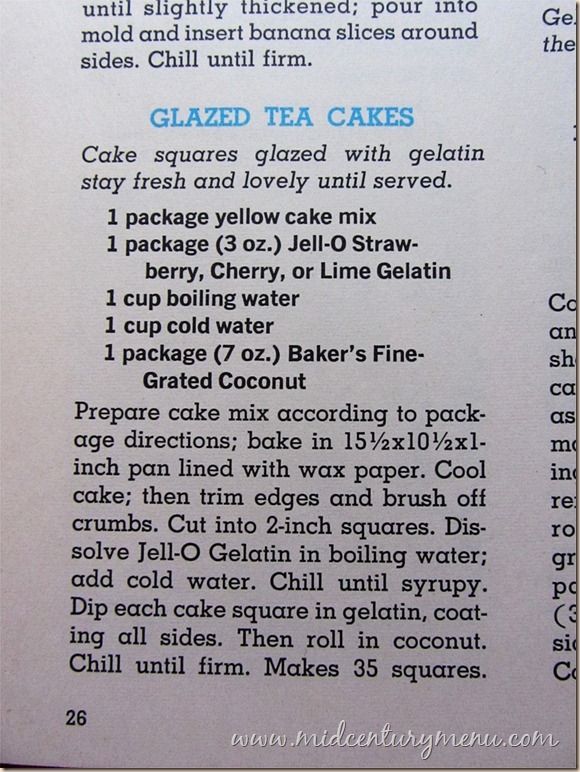 I just had to get this recipe out of the archives last week to fill a reader’s request, so I thought I would post it again so you could all see the glory of gelatin mixed with cake. 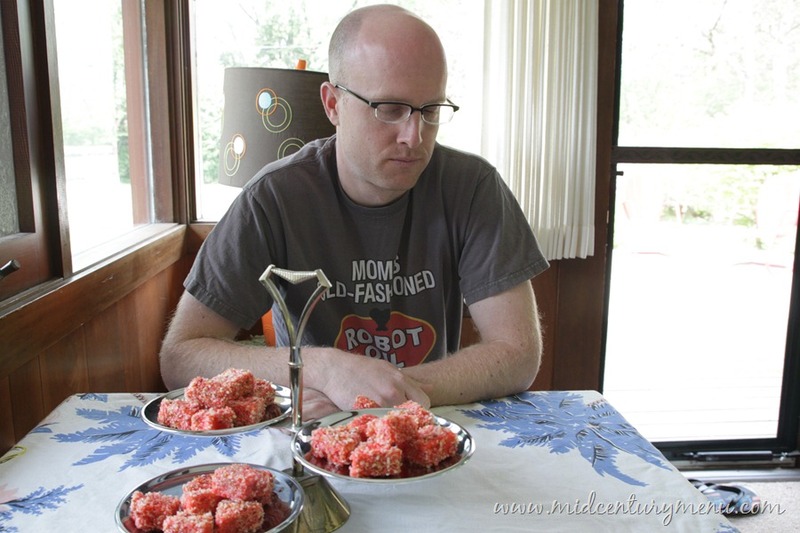 This recipe was originally posted in November of 2012 after our Gelatin Contest that consumed most of our summer and life. 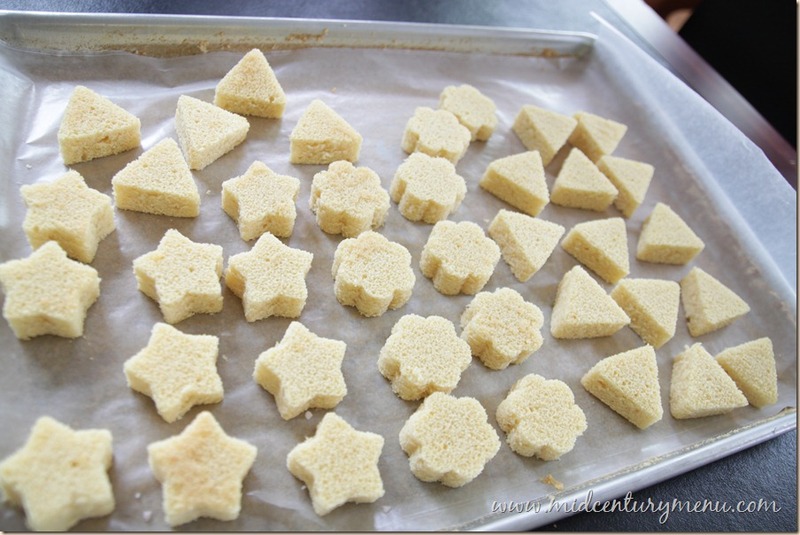 While I tried to make these in clever little shapes, squares are the best and the easiest to roll in gelatin! Hooray for gelatin!! 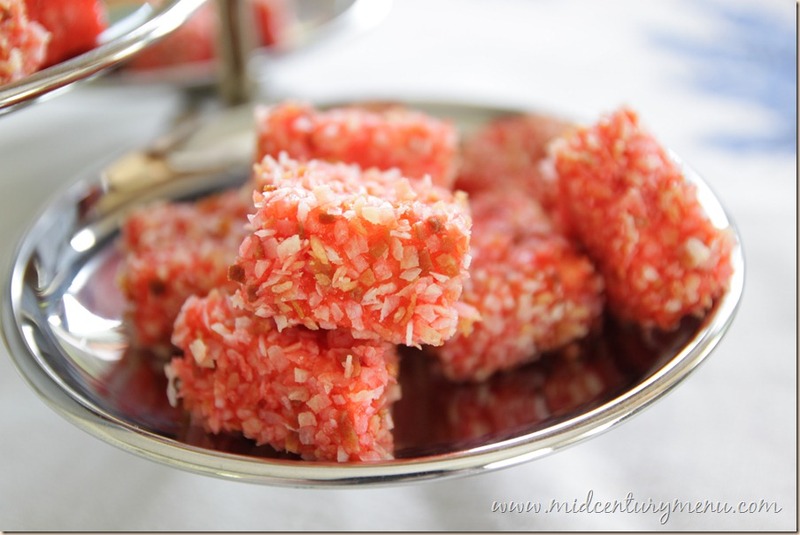 Today we have another recipe that was submitted for our Gelatin Contest, but I have to admit that this is one that I was very excited to see because I have been dying to try this recipe for ages. These adorable little things are Glazed Tea Cakes. And yes, they ARE covered with gelatin. This recipe was submitted by Cat from Michigan, who also sent in the recipe for Barbecue Salad, which we ended up turning into Barbecue Cheese Cracker Pie. 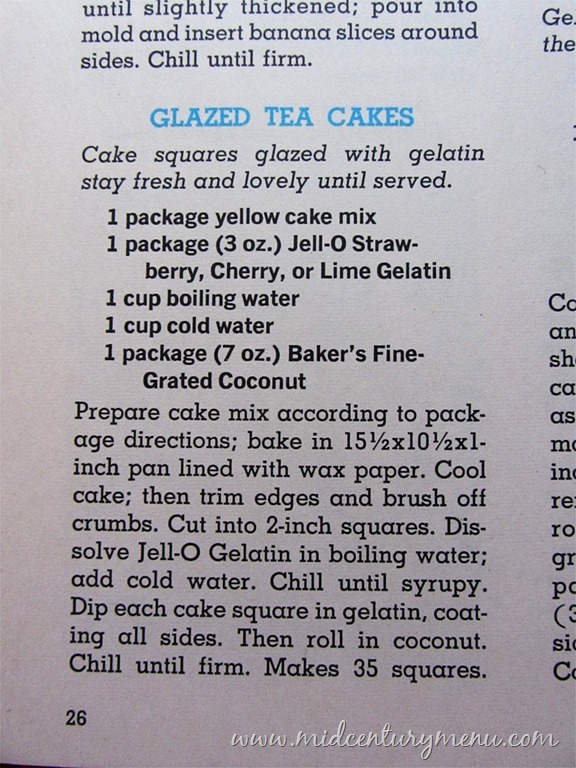 Both of these recipes are from the vintage classic, The Joys of Jell-O. Since Barbecue Salad was originally supposed to be served in cubes and we ultimately ended up making the pie variation, I thought it was only fair to make these cakes for Cat since they are also supposed to be served in cubes. Prepare cake mix according to package directions; bake in a 15½ by 10½ inch pan lined with wax paper. Cool cake, then trim edges and brush off crumbs. Cut into 2 -inch squares. Dissolve Jell-O in boiling water; add cold water. Chill until syrupy. Dip each cake square into gelatin, coating all sides. Then roll in coconut. Chill until firm. Of course, what fun would that be? So, I ended up making my cake into half cubes, and half into some adorable shapes using modern and vintage cutters. Adorable, huh? Well, turns out it was all a huge waste of time, because when they were finished they all ended up looking the same anyway. Besides the fact that I lost my shapes, which wasn’t a huge deal, these things were a total pain to make. First off, they were incredibly messy. I wish I would have taken a picture of the carnage that ensued when I did this, but at the time I was too covered with gelatin to touch my camera. I thought it would just be a matter of dipping the cake into the gelatin on a fork (like you would with chocolate) and having it coat. Wrong! You had to roll the cake around with your fingers in the gelatin to get good coverage. This led to some very, very red fingers. In addition, the coconut refused to stick to the gelatin-covered cake squares. I had to toast the coconut to make it dry enough to stick to the gelatin. In the end, though, they looked pretty cute. Although I don’t think Tom was too impressed. Tasted like wet yellow cake covered with toasted coconut. Tasted a lot like Jell-O poke cake, which I am not too fond of, but if you like that sort of thing these might be for you. After about 24 hours in the fridge they became less “wet” and more “moist” which was nice. The one outstanding thing about this recipe was that the cake never really dried out, even a week later. Would be a good recipe if you are going to have a party for kids and you want to make the snacks WAY in advance. Thanks, Cat, for sending in this recipe! I have been wanting to try it for ages! 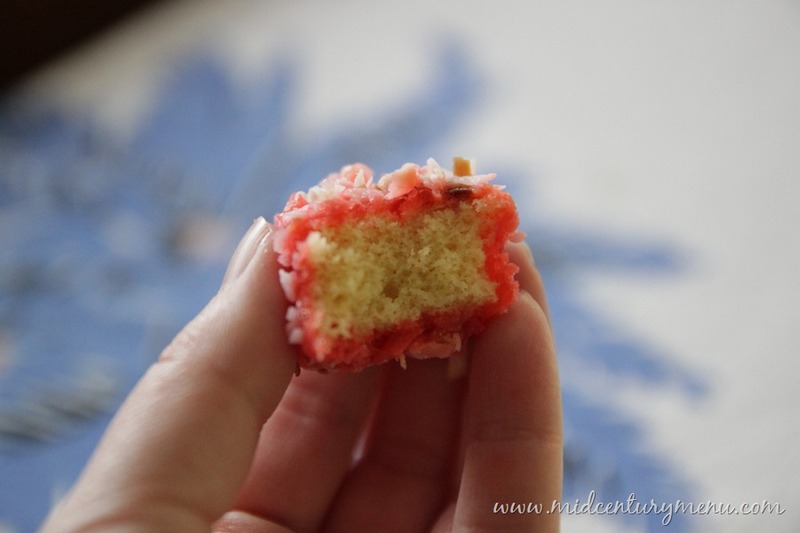 These look like the very first version of Raspberry Zingers! Yes, that’s what I thought too, Raspberry Zingers! It sounds like they didn’t taste like Raspberry Zingers, though. I made them today along with brownies early because today is going to be a scorcher! My husband and myself have my 4 grown children, significant others and my grandchildren for Sunday Suppa. Today we’re ordering out….too hot to cook. So when I made the Rasberry coconut zinger things…wear plastic gloves. I bought store bought yellow pound cake, made the jello as instructed and after slicing and dipping and rolling in coconut placed them on a nice glass dish….it looks like I’ve been working all day! It was the simplist dessert and they are in the fridge chillin! Now out to the POOL! My mother used to make that cake where you poked holes in it and poured in Jello-O. I remember watching her make it but I don’t remember eating it. Hmmm. 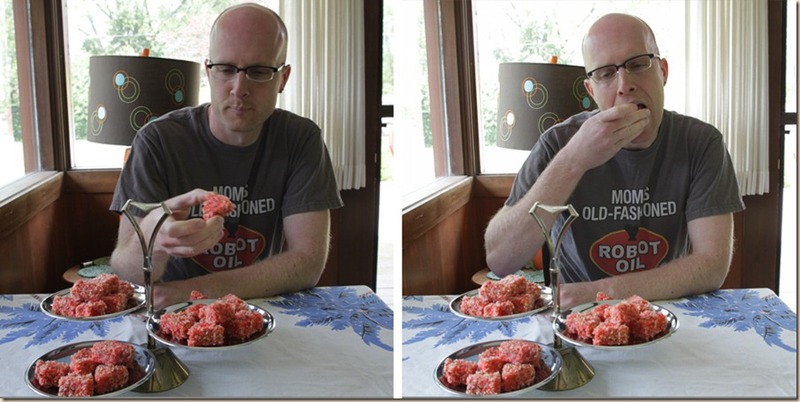 These don’t seem all that weird to me – in New Zealand this is a pretty common cake, and it’s called a lamington. It’s made with sponge cake, though, not generic ‘yellow cake’. I prefer the chocolate version over the raspberry (the only two acceptable flavours) – essentially you make a syrupy chocolate icing and roll it in coconut. I’m not sure how the raspberry one is done, but suspect it’s only marginally more sophisticated than jelly/Jell-O. They can also be filled with whipped cream. Have you ever seen or made a stain-glass window cake? It isn’t really cake, it’s basically cut up pieces of Jello folded into Dream-Whip. I think the bottom has crushed vanilla wafers. My mom made it, so I probably have the recipe in one of her cook books, if you’re interested. 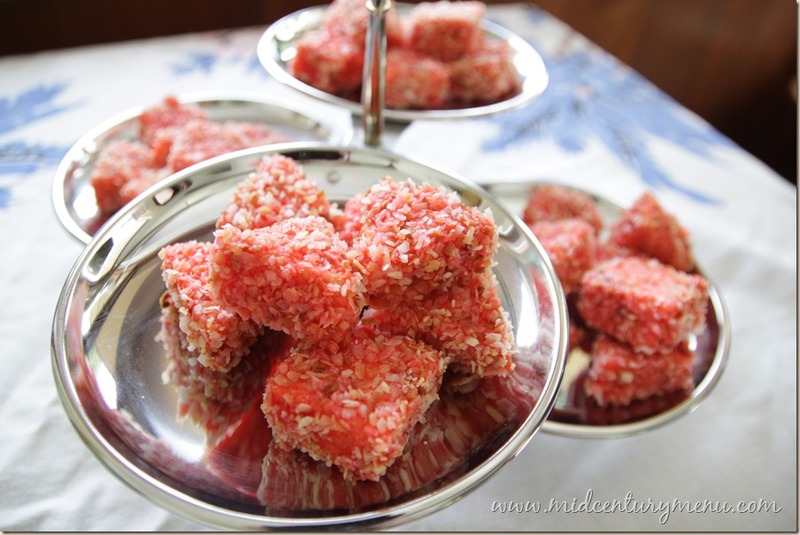 Yes, these are very popular in New Zealand and Australia and are called Lamingtons. You can buy them at bakeries, cafes, cake shops, even supermarkets. Sponge cake is better than yellow cake for this recipe. In Western Australia we call these jelly cakes. Definitely better with sponge cake. We used to spend the afternoon with slabs of sponge making jelly cakes and lamingtons for the freezer. My mum still makes these!